The goniophotometers from Instrument Systems allow angle-dependent optical parameters of LED and SSL products to be comprehensively analyzed. This covers the entire value chain from single packaged LEDs, through LED modules and light engines to large SSL lamps and luminaires. All goniophotometers are designed as Type C with a horizontal alignment of the optical axis (turning luminaire configuration). Each goniometer sets benchmarks in its class for precision, reliability and handling. If these goniophotometers are combined with a spectroradiometer from Instrument Systems, they are able to determine not only photometric data but also spectral quantities, such as color coordinates, color temperature, and even color rendering index as a function of angle. 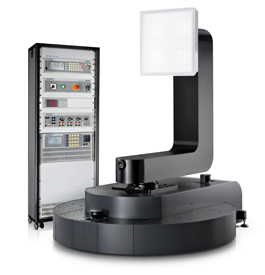 The new LGS 1000 goniophotometer analyzes the angle-dependent spatial radiation properties of large SSL lamps and LED modules up to a length of 1900 mm and weight of 50 kg. The Type C design with horizontal optical axis permits a much simpler setup for the measuring path – despite its impressive dimensions of 1850 x 1492 x 1798 mm – than with complex mirror goniophotometers. Combined with a spectroradiometer from Instrument Systems, all spectral quantities such as color coordinates, color temperature and even color rendering index can be determined as a function of angle. C-plane measurements can also be carried out very quickly “on the fly” using the Optronik DSP Photometer. The LGS 1000 comprises the goniometer itself with a sample plate for fixing the test specimen and LGS controller. The control unit is located in a separate 19” rack. 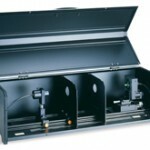 The goniophotometer system from Instrument Systems includes a comprehensive range of accessories such as the luminous flux integrator which measures test objects up to a diameter of 200 mm in their required burning position in conformance with standards CIE S 025, EN 13032-4 and IES LM-79-2008. An additional burning position correction enables the characterization of larger probes. This innovative accessory permits measurement of all photometric quantities of the test item in a luminaire orientation other than the designed burning position. The mechanical design guarantees a comfortable setup of the operational position necessary for the determination of correction data using the auxiliary photometer method conforming to the latest international standards (CIE S 025 and EN 13032-4). The LGS 350 Goniophotometer / Goniospectroradiometer was developed for the analysis of angle-dependent spatial radiation properties from small to medium-sized SSL luminaires and LED modules. The test specimen is operated in a horizontal burning position and measurements can be taken at an angular range of ±160° in the gamma / theta axis. Combined with a spectroradiometer from Instrument Systems, all spectral quantities such as color coordinates, color temperature and even color rendering index are determined as a function of angle. The Optronik DSP Photometer can also be used to carry out C-plane measurements very quickly “on the fly”. The LGS 350 comprises the goniometer with a sample plate for fixing the test specimen and the LGS Controller that drives the stepper motor and the angle display. If a photometer is used, the LGS Controller also displays the measured values in candela or lux. Goniometer with stable base and integrated LGS Controller. The structure is particularly space-saving and compact, as well as providing very high mechanical stability with the floor. 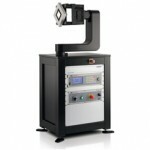 Goniometer in benchtop version with separate 19” rack for the LGS Controller. This configuration is mobile and can be used flexibly.